CUSTOMER SERVICE Call 0161 220 1746. Opening Hours Monday to Friday (9.00am to 5.00pm). 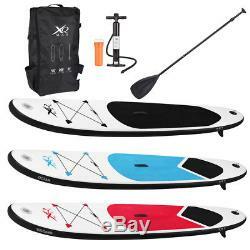 XQMAX Sports Stand Up Inflatable Paddle Board 10' With Bag & Pump & Oar. 10ft (305cm) inflatable SUP is a great all-rounder for waves and flatter water. Rigid Drop Stitch design with 3 modelled fins for directional stability. Adjustable aluminium oar can be used for surfing or paddling. Comes with deluxe backpack, air pump, pressure gauge and leash. Size: (L)10 (305cm) x (W)28" (71cm) x (D) 4" (10cm) User Weight Capacity: 100kg / Air volume: 178L. Looking for an inflatable Stand Up Paddle Board thats as comfortable on the waves as it is on a lake or river? The XQMAX Sports is a great all-rounder. It has a surf-inspired longboard shape to handle mid-size waves but with less curvature than a rocker board to easily glide on flatter waters. The inflatable SUP comes with all of the kit you need to carry it, inflate it and hit the open water, including a deluxe backpack, manual inflation pump and adjustable extra lomg aluminium oar. For unparalleled strength and durability, the XQMAX Sports SUP has a high-density double-wall construction. Premium marine grade material that can withstand extreme nautical conditions, including exposure to petroleum products and ultra-violet rays. The hardwearing material is used on the surface of the SUP to protect it from wear and tear whilst youre paddle boarding. XQMAX Sports is responsible for giving the SUP superior strength and rigidity. When inflated, it can support a considerable weight of 100kg. When deflated, it is lightweight and portable to easily carry. 3 Modelled Fins: These help to provide directional stability so that its easier to navigate your way through the water. The fins also help you to move faster through the waves. They have a flexible design which is more resistant to heavy knocks against rocks and other obstacles. Elastic Cord For Storage: Elastic bungee cords at the front of the SUP allow you to easily carry a repair kit, camera, food and other provisions when youre paddle boarding. Be sure to check that the equipment doesnt push the weight capacity over the 100kg limit. Non-Slip Traction Pad: If youre new to paddle boarding, one of the hardest things to get to grips with is standing up. The non-slip traction pad on the surface of the SUP provides superior grip so that its easier to hold your balance when youre standing up and paddle boarding. Convenient Deck Handle: Pulling the SUP out of the water isnt easy. It measures over 9 long, weighs over 15kg and can be very slippery when its wet. A pre-fixed deck handle allows you to drag it in and out of the water with greater ease. The SUP includes XQMAX Sports Pump with Pressure Gauge to easily inflate it to the correct volume without the risk of over-inflation. An adjustable Aluminium Oar (178cm - 220cm) is also included along with a Deluxe Backpack to conveniently carry the SUP to your destination. YOU MAY ALSO BE INTERESTED IN. Welcome to Toyplanet-Today, a Division of AGP Ltd, a UK based business that has been operating online since 2004. We will only deliver to addresses with a UK Postcode. Once we know you have not received your item we will investigate the matter fully both internally and with our carriers. Unfortunately we cannot investigate non receipt deliveries after this time has elapsed. Investigations into lost parcels can take up to 14 days. Some of the photographs used are library images and we are therefore not responsible for any colour variances or style updates. We guarantee to send you the specification as advertised in the product description. Upon acceptance of the damage, Advanced Global Productions Limited will firstly either (a). Have the item exchanged for same model. You must notify us that you are returning your order as soon as it develops a fault and you will be financially responsible for the return. All replacements are subject to stock availability at the time of processing. The item "Paddle Board 10ft Sports Surf Inflatable Stand Up Water Racing SUP Bag Pump Oar" is in sale since Friday, March 9, 2018. This item is in the category "Sporting Goods\Surfing\Other Surfing". The seller is "toyplanet-today" and is located in Manchester. This item can be shipped to United Kingdom, United States, Japan, Canada, Ireland, Australia, Germany, France, Greece, Italy, Spain, Russian federation, Austria, Belgium, Bulgaria, Croatia, Cyprus, Czech republic, Denmark, Estonia, Finland, Hungary, Latvia, Lithuania, Luxembourg, Malta, Netherlands, Poland, Portugal, Romania, Slovakia, Slovenia, Sweden, Brazil, New Zealand, China, Israel, Hong Kong, Norway, Malaysia, Singapore, South Korea, Switzerland, Taiwan, Thailand, Chile.